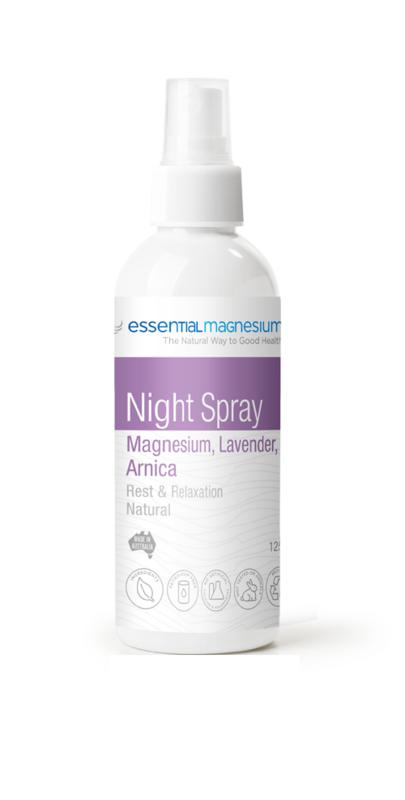 NIGHT SPRAY is a unique blend of Magnesium Chloride, Arnica, Lavender and Sweet Marjoram. These ingredients work together and may help a more restful sleep. SIMPLE & EASY TO USE: Our Night Spray can be applied liberally to the feet, legs and back of the neck prior to bed. INGREDIENTS: Magnesium Chloride Hexahydrate, Aqua, Arnica Oil, Lavendula Angustifolia, Marjoram Hortensis, Polysorbate. Information used on this site is not intended to diagnose, treat, cure or prevent any disease. If you are concerned about your magnesium levels, please contact your GP. Use only as directed.